When I first arrived in Taiwan for my two-month trip, I was afraid that I’d be reluctant to go back to my parent’s hometown, Yilan, to visit my grandparents since Taipei was so much fun (shopping, karaoking, eating, the exciting, cosmopolitan area, etc). However, once I arrived at my Grandma’s house, I suddenly remembered why I loved my Yilan home so much. Three words: Green. Onion. Pancakes. They are so delicious and my Grandma is an expert at making them. Ever since I was a little girl, visiting Taiwan in the summer and getting eaten alive by mosquitos, I always looked forward to eating my Grandma’s green onion pancakes in the morning. Even today, long after my Grandma has stopped dying her hair black or going on three-hour jogs in the morning, I can still hear her hard at work in the kitchen, rolling out dough and frying it. The smell of toasted sesame is such a delicious smell to wake up to! For the uninitiated, green onion pancakes are a Chinese dish (and very popular in Taiwan street stands) that’s basically a flat bread with scallions or green onions (and in my grandma’s version, dried shrimp) rolled inside and pan-fried with oil. The result is a delightful, savory pancake (or more like flatbread for Westerners) that’s crispy on the outside and has layers of chewy bread on the inside. 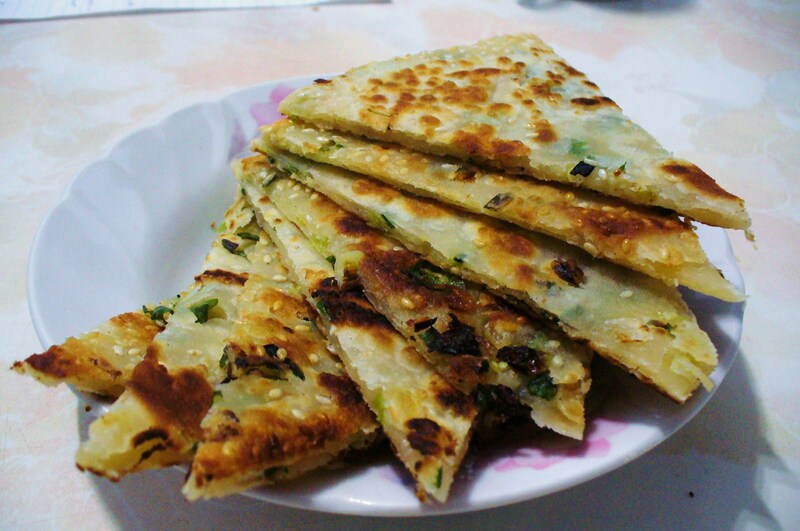 It’s so good that even when I was a picky six-year old who ate only plain rice and dumpling skins, I absolutely loved green onion pancakes. My favorite thing about my grandma’s version, above the ones I get at restaurants is how there are salty little surprises in the dough, with crunchy dried shrimp and green onions exploding with that hidden fifth flavor, umami. Add 2 spoonfuls of oil into a hot pan, then add 1 spoonful of salt and a small handful of flour. Stir. Then set aside. Heat 1 and 1/2 cup of water over high heat, then stop the heat a little before the boiling point. Add 1 spoonful of the oil to 4 cups/rice bowls of flour (1 bowl = pancake) in a large bowl. Slowly add the hot water to the mixture, stirring with your hands simultaneously until it forms flakes/clusters of dough. Knead the the clusters into one ball of dough. Transfer the ball of dough to a cutting board, then knead with both hands into a roll about a foot-long. Sprinkle the board with flour, then begin rolling the dough out into a flat, rectangular shape with a rolling pin. Spread the oil/flour mixture from the pan across the dough (you don’t have to use all of it, just as necessary). Sprinkle the dough with dried shrimp and green onions (you don’t have to use all of your dried shrimp or green onions either, just as much as you want). Roll up the dough from the bottom to the top, tightly like a yoga mat. Seal up the ends. Then section the roll into 4 by twisting them off and sealing of the ends (very important to seal off the ends of the small rolls, make sure none of ’em green onions are peeking out!) Slightly flatten the balls. Sprinkle and spread a little flour and water onto one side, then squish that side into a plate of sesame seeds. Roll out the balls (sesame side down) into flat circles, nearly one foot in diameter. (Tip: to get a really nice circle, turn the dough constantly as you roll). Pan-fry the dough in low heat with lots of oil. Fry until golden brown, then cut into slices. (Cured jamon ham + chorizo + salchicha + fried egg) + (cheese + avocado + tomato + onion + jalapenos) + lightly toasted sesame roll = the absolutely monstrous cubana torta at San Jose’s Bakery Mexico No. 2. Just one of these babies is enough to stuff you for an entire day, not to mention take care of your sodium and cholesterol allotment neatly. Bakery Mexico No. 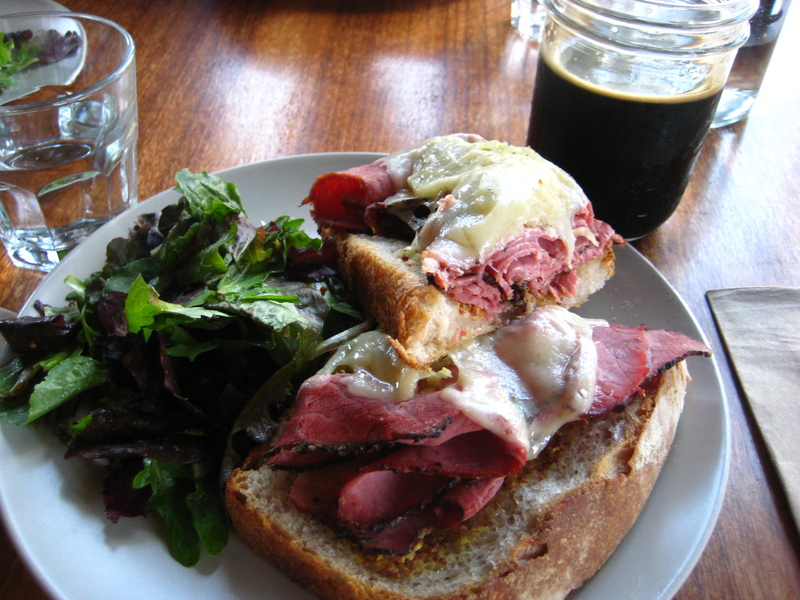 2, located in the heart of downtown San Jose on E. Santa Clara between 2nd and 3rd, is a combination deli and bakery with friendly service and huge portions. I went there yesterday with my parents before our excursion to the Tech Museum of San Jose’s free family day. 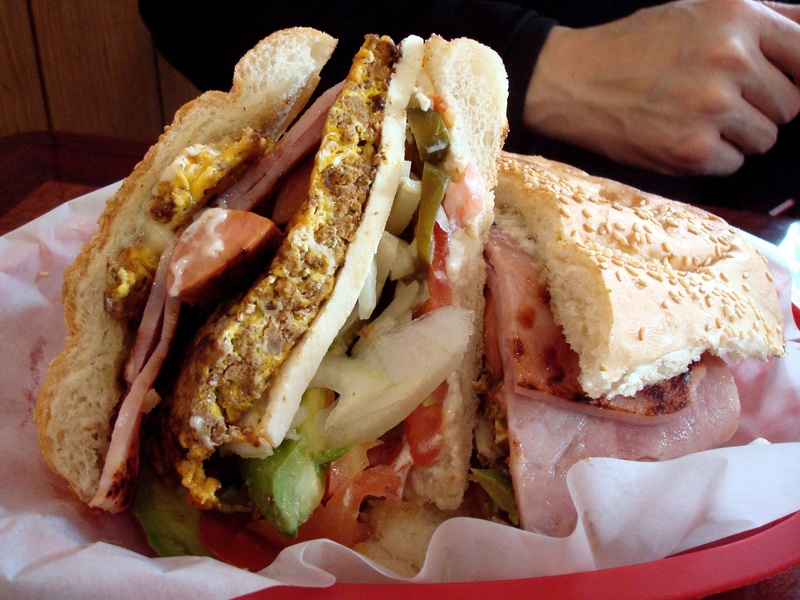 Recommended: My dad ordered the monstrous cubana torta ($6.00), which tasted as amazing as it looks and was my favorite torta of the three, especially because of the fried egg. I found the salchicha (Vienna sausage) to be an off-putting addition, but the overall torta was so good that I rolled with it anyway. 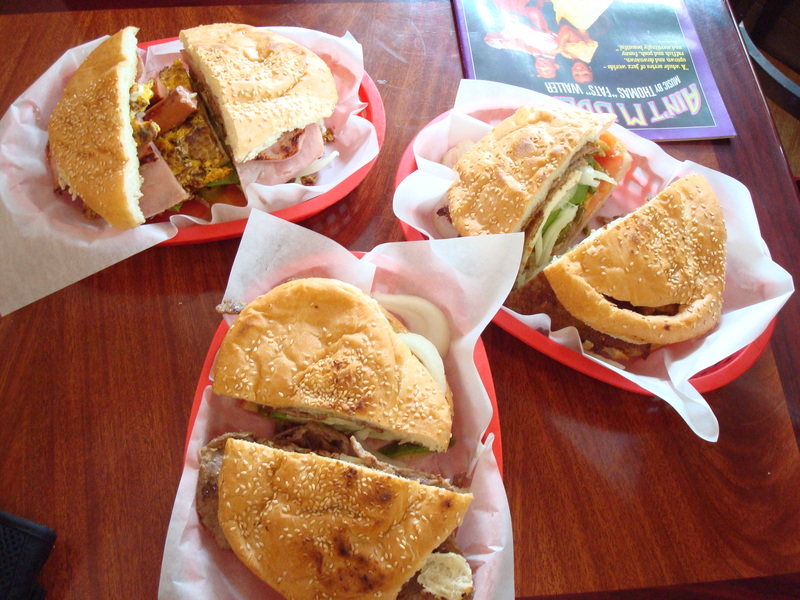 I was pleased with my pork loin lomo torta ($5.50) as well; the meat was slightly dry but flavorful nonetheless. From the bakery, we ordered some of the pan dulce (sweet breads) Yelpers were gushing over — our cashier’s two personal favorites, the pound cake with chocolate crust and the cheesecake. Both were super delicious; I’m normally not huge on cheesecake, but this version was much denser than American cheesecake and just sweet enough without being cloying. Not recommended: The flavor of my mom’s breaded steak milanesa torta ($5.50) was, sadly, overpowered by the greasiness of the breading. They were out of the mango liquados we ordered, and had to give us strawberry liquados instead, which essentially amounted to a regular strawberry milkshake. Overall: A decent tortas joint; not worth a special trip to San Jose, but I’d come back if I was in the area with a huge appetite. I’d combine the best of both worlds by ordering a combination torta with lomo (pork loin), pierna (smoked ham), and huevos for a trifecta of awesome. I would also definitely go back for the pan dulce selection. 87 E Santa Clara St.
Alas, school + recruiting for summer internships have consumed most of my time lately, but I’m back! Cindy and I had breakfast at Powderface on our second day of interviews. The shop is located in a shopping center right off the Fruitvale BART station, and looks like a fairly ordinary semi-modern cafe, with high tables and chairs, black furniture, free wi-fi, the like. We originally intended to just grab a pastry to go. While the cafe’s menu seemed pretty standard, a quick look to the walls, adorned with pictures of people with powdered sugar smothered around their mouths, revealed the store’s true signature product: New Orleans-style beignets. While I am Californian through and through, I have to admit there is something irresistible about a piece of fried dough covered in sugar. 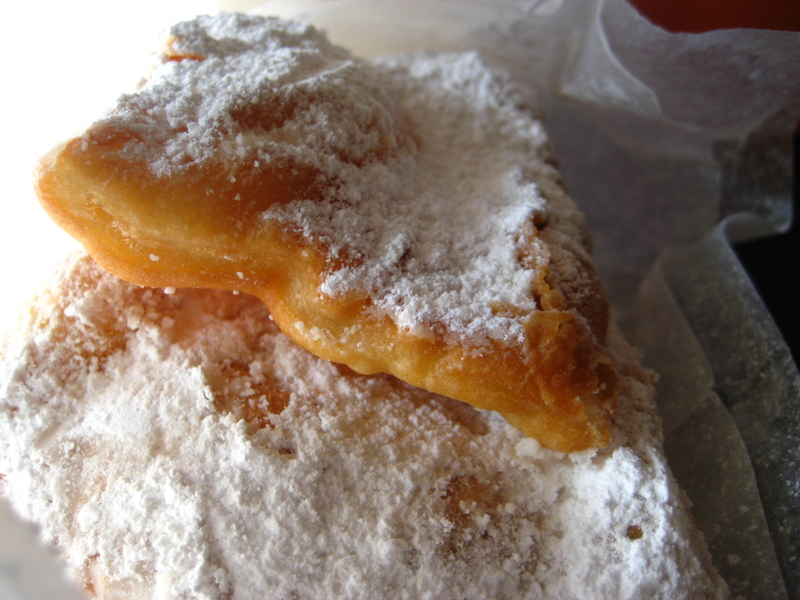 Powderface's New Orleans-style beignets, served with powdered sugar on top. The only other place I’ve had beignets at is Angeline’s Kitchen, a Foodie Friday favorite that, like Gregoire, Cheeseboard, and Wood Tavern, has yet to be blogged about. Angeline’s beignets are pillow-like and almost always served with 2+ cups powdered sugar on top. In contrast, Powderface’s beignets are served with much less sugar. The beignets were more fresh and crunchy here than Angeline’s. I wasn’t used to the crunchiness, but the little time it took to consume these morsels attests to my approval. I’ll have to have Angeline’s again to more directly compare, but Powderface was a pleasant surprise in a most unexpected place. I’ll have to look for some place to have lunch/dinner in Fruitvale to justify the amount of time it takes to get there, but this place is definitely worth checking out. A warning: Cindy and I had some trouble eating these cleanly. Best to not attempt eating these in dark business clothes, like we did. We had to adopt some weird eating scheme where we had to eat with arms outstretched as far away as possible from our bodies. I recently took a trip to the Boston/Cambridge area, and in addition to witnessing some beautiful scenes of New England foliage, I also made the rounds around the food circuit. 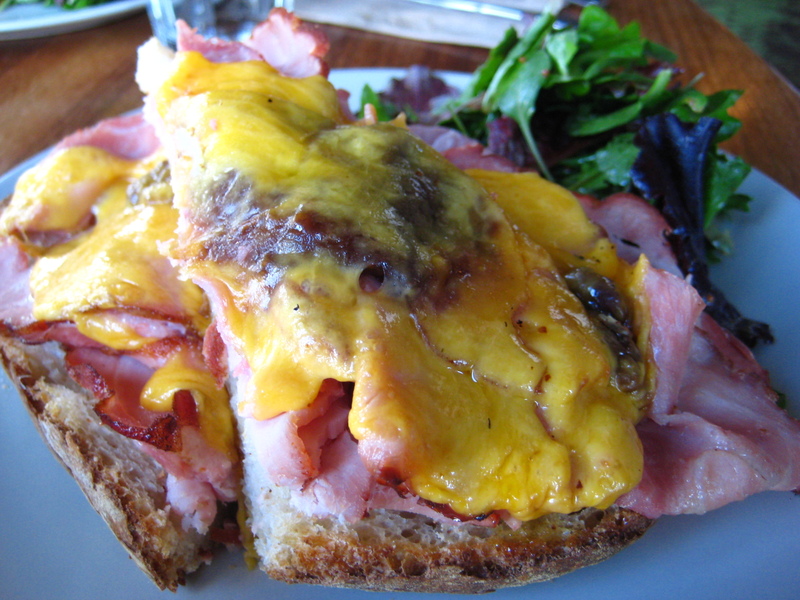 Most of my time was spent in eating in the Cambridge area, especially around Harvard Square. 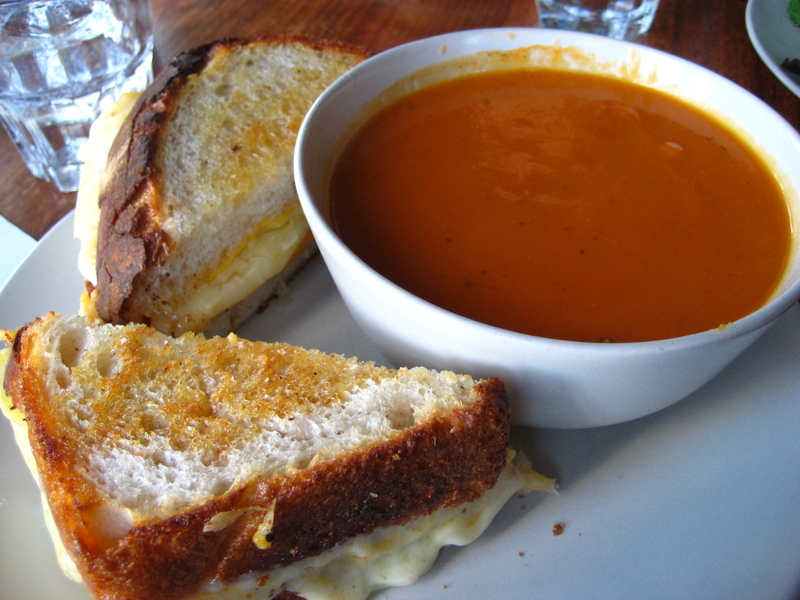 If you’re feeling like a hot drink and you’re near Harvard Square, head on over to L.A. Burdick on Brattle Street. It’s a small, narrow shop, with a glass display of delectable chocolates at the front. In the back, you can order an array of drinks. Anna took me here on a particularly blustery day. Delicious raspberry tart from L.A. Burdick, served with a side of whipped cream. I ordered a dark hot chocolate, and Anna got a chai. The flavor was wonderful–not too sweet. Even the chai wasn’t that bitter, even though Anna steeped it for a while. L.A. Burdick also scores extra points for cute atmosphere and tasty tarts, though its tables are a bit small for proper coffee shop studying/working. A great place for a snack or afternoon coffee/tea.